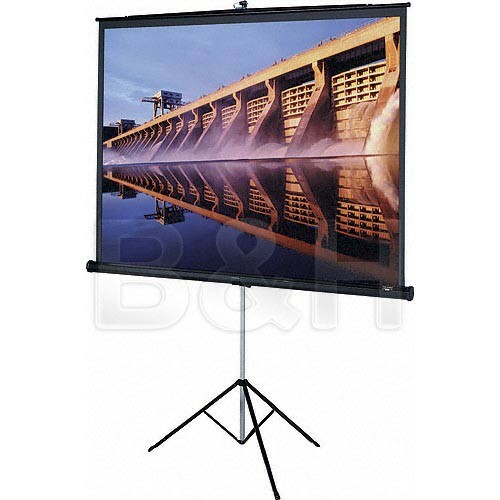 The 50 x 67" Versatol Tripod Projection Screen from Dalite is a simple 18 gauge steel screen that is suitable for all venues - home, business and education. The legs lock automatically when set up and are released by a simple button push. It is activated by an easy to access pull tab that raises and lowers the screen with ease. The screen surface is seamless and flame retardant as well as being mildew resistant, assuring years of trouble free use. At a more than affordable price, the Versatol is a solid alternative when a more sophisticated motorized installation is not permitted or desired. Box Dimensions (LxWxH) 83.5 x 8.8 x 5.5"
76034 Versatol Tripod Projection Screen (50 x 67") is rated 4.0 out of 5 by 2. Rated 4 out of 5 by RAPro from Easy Setup Works as intended and the screen is made of quality material. Setup is really easy and quick. My projector has a keystone adjustment, so I didn't need a screen with that built in (this one doesn't come with a keystone adjustment). Slight issue I've already seen is the black powder coating can get scratched, yet that's really minor in my book. Overall, a good product for presentations. Rated 4 out of 5 by Anonymous from Versatol 50-inchx67 inch projection scre The quality is great and easy to set up. It's big and also heavy. I would have preferred to have the ability to lower the screen from its lowest setting. This could be accomplished by drilling an extra hole. If I was using it in a situation requiring a lower setting I would consider that modification. Excellent quality and value.